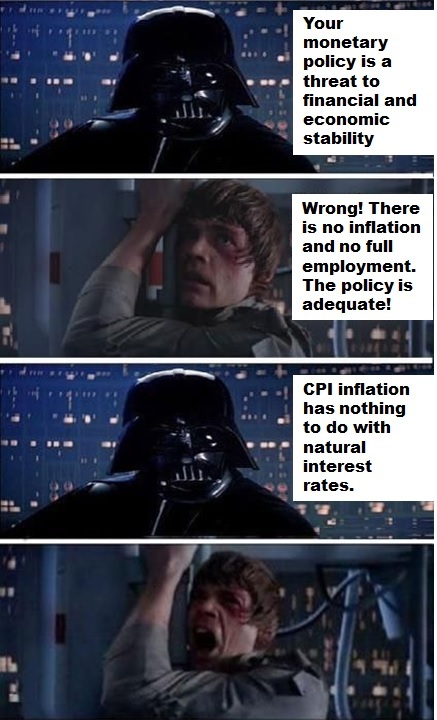 Is the BIS on the Dark Side of macroeconomics? The BIS has got a hobby: to annoy other economists and central bankers. It’s a good thing. It published its annual report about two weeks ago, and the least we can say is that it didn’t please many. Gavin Davies wrote a very good piece in the FT last week, summarising current opposite views: “Keynesian Yellen versus Wicksellian BIS”. What’s interesting is that Davies views the BIS as representing the ‘Wicksellian’ view of interest rates: that current interest rates are lower than their natural level (i.e. monetary policy is ‘loose’ or ‘easy’). On the other hand, Scott Sumner and Ryan Avent seem to precisely believe the opposite: that current rates are higher than their natural level and that the BIS is mistaken in believing that low nominal rates mean easy money. This is hard to reconcile both views. Neither is the BIS particularly explicit. Why does it believe that interest rates are low? Because their headline nominal level is low? Because their real level is low? Or because its own natural rates estimates show that central banks’ rates are low? It is hard to estimate the Wicksellian ‘natural rate’ of interest. Some people, such as Thomas Aubrey, attempt to estimate the natural rate using the marginal product of capital theory. There are many theories of the rate of interest. Fisher (described by Milton Friedman as America’s best ever economist), Bohm-Bawerk, and Mises would argue that the natural interest rate is defined by time preference (even though they differ on details), and Keynes liquidity preference. Some economists, such as Miles Kimball, currently argue that the natural rate of interest is negative. This view is hard to reconcile with any of the theories listed above. Fisher himself declared in The Rate of Interest that interest rates in money terms cannot be negative (they can in commodity terms). The second issue to note is that when the natural rate is higher than the money rate there is no necessary impact on the general price level. As the Swedish economist Bertie Ohlin pointed in the 1930s, excess liquidity created during a Wicksellian cumulative process can flow into financial assets instead of the real economy. Hence a Wicksellian cumulative process can have almost no discernible impact on the general price level as was seen during the 1920s in the US, the 1980s in Japan and more recently in the credit bubble between 2002-2007. But there are other problematic issues. First, inflation (as defined by CPI/RPI/general increase in the price level) itself is hard to measure, and can be misleading. Second, as I highlighted in an earlier post, wealthy people, who are the ones who own most investible assets, experience higher inflation rates. In order to protect their wealth from declining through negative real returns (what Keynes called the ‘euthanasia of the rentiers’), they have to invest it in higher-yielding (and higher-risk) assets, causing bubbles is some asset classes (while expectations that central bank support to asset prices will remain and allow them to earn a free lunch, effectively suppressing risk-aversion). If natural rates were negative – or at least very low – and the environment deflationary, it is unlikely that we would witness such hunt for yield: people care about real rates, not nominal ones (though in the short-run, money illusion can indeed prevail). But this is not only an ultra-rich problem: there are plenty of stories of less well-off savers complaining of reduced purchasing power. Meanwhile, the rest of the population and overleveraged companies, supposedly helped by lower interest rates, seem not to deleverage much: overall debt levels either stagnate or even increase in most economies, as the BIS pointed out. Banks also suffer from the combination of low rates* and higher regulatory requirements that continue to pressurise their bottom line, and have ceased to pass lower rates on to their customers. In this context, the BIS seems to have a point: rates may well be too low. Current interest rate levels seem to only prevent the reallocation of capital towards more economically efficient uses, while struggling banks are not able to channel funds to productive companies. Critics of the BIS point to their call to rise rates to counter inflation back in 2011. Inflation, as conventionally measured, indeed hasn’t stricken in many countries. In the UK and some other European countries though, complaints about quickly rising prices and falling purchasing power have been more than common (and I’m not even referring to house price inflation). This mismatch between aggregate inflation indicators and widespread perception is a big issue, which underlies financial risk-taking. In the end, Keynes’ euthanasia of the rentiers only seem to prop up dying overleveraged businesses and promote asset bubbles (and financial instability) as those rentiers pile in the same asset classes. I side with the BIS in believing this is not a good and sustainable policy. I also side with the BIS and with Mohamed El-Erian in believing in the poor forecasting ability of most central bankers, who seem to constantly display a dovish view of the economy, which apparently experiences never-ending ‘slack’, as well as the very uncertain effect of macro-prudential policies, which cannot and will not get in all the cracks. Nevertheless, many mainstream economists and economic publications seem to be overconfident in the effectiveness of macro-prudential policies (see The Economist here, Yellen here, Haldane here, who calls macropru policies “targeted lightning strikes”…). While central banks’ rates should probably already have risen in several countries (and remain low in others, hence the absurdity of having a single monetary policy for the whole Eurozone), everybody should keep the BIS warnings in mind: after all, they were already warning us before the financial crisis, yet few people listened and many laughed at them. Unfortunately, politicians and regulators have repeated some of the mistakes made during the Great Depression: they increased regulation of business and banking while the economy was struggling. I have many times referred to the concept of regulatory uncertainty, as well as the over-regulation that most businesses are now subject to (in the US at least, though this is also valid in most European countries). Businesses complaints have been increasing and The Economist reported on that issue last week. In the meantime, while monetary policy has done (almost) everything it could to boost credit growth and to prevent the money supply from collapsing, harsher banking regulation has been telling banks to do the exact opposite: raise capital, deleverage, and don’t take too much risk. In the end, monetary policy cannot fix those micro-level issues. It is time to admit that we do not live in the same microeconomic environment as before the crisis. What about cutting red tape to unleash growth rather than risk another financial crisis? * Yes, for banks, rates are low, whichever way you look at them. Banks can simply not function by earning zero income on their interest-earning assets (loan book and securities portfolio). The theory of speculation tells us that bubbles form when people think they can find some greater fool to sell to. But when practically everyone is convinced that asset prices are relatively high, like now, it’s pretty obvious that there aren’t many greater fools out there. Really? No, speculation involved buying as long as you believe you can get the right timing to exit the position. Even if everyone believed that asset prices were overvalued, as long as investors expect prices to continue to increase, speculation would continue: profits can still be made by exiting on time, even if you join the party late. 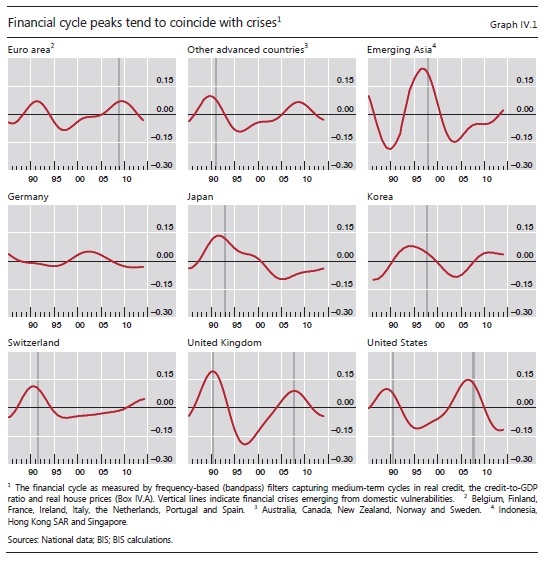 It is interesting to see how coordinated financial cycles have become. Yet the BIS seems not to be able to figure out that its own work (i.e. Basel banking rules) could well be the common denominator of those cycles (which were rarely that synchronised in the past).